The DreamStation-Pro for Vegas Pro 16 is our 7th generation of our post production Intel Core i7 video editing computer systems for SD-HD-2K-4K-5K-UHD, video editing, compositing and post production. Select the options below and see your price in real time. Call us at 1-877-203-0871 x205 and we will walk you through your options to meet your needs and your workflow. Make your selections, and then purchase your system on our secure system. We will contact you within minutes before we finalize your order to insure you have everything you need and did not order something you don't need. Click on ADD TO CART on the right side of the lower banner to purchase. You can select your options and save your selections in a custom quote. Select SAVE QUOTE by scrolling down to the very bottom of the page on the left. Give us a call to go over your selections, print it out, or update it at your convenience. Each workstation is meticulously assembled, tested, and supported in the USA. Systems generally take 7 to 10 business days to build, test, and ship. All of our case solutions include a small 3.5" bay in the front. We offer a couple of different options for this bay. You can choose a Kiosk Quality USB 3.0 card reader with (1) USB 3.0 port that supports all popular memory cards including SD cards used by today's consumer and professional cameras. The second choice for the upper bay is a (4) port USB 3.0 hub. The third choice is an external card reader combined with the (4) port USB 3.0 ports. Each system includes Restore software on a flash drive with our factory image, and the ability to make you own images. All of our support offerings all include Remote Tech. This service allows us to log into your system with your permission and troubleshoot any issues just like we were sitting in front of the system. This workstation is based on the Intel Z370 chipset. The 'chipset' is responsible for communication between the CPU and the rest of the devices. Standard features of the Z370 chipset include plenty of USB 3.0/3.1 ports, USB-C Gen 2, m.2 storage options, support for the Intel 630 UHD GPU. The case we offer with this system features front removable hard drives. In addition to the convenience, the back-plane offers power and cabling stability. This case has (4) Front accessible removable SATA bays, a 900W Platinum Rated High Efficiency power supply, and 2 additional bays for CD/DVD/Blu-ray optical drives or an additional hard drive. Our power supplies are all Platinum LEVEL 94% Efficient. That means that they output 94% of the power they take in. For example, even our Single Core i7 7700K with every slot filled, 6 hard drives, and the CPUs at 100%, the system never gets above 400 watts, leaving plenty of headroom. This means that a powerful system like this will not output a bunch of wasted wattage in the form of heat. The Coffee Lake Core i7 8700K offers a 3.7GHZ clock speed, 6 physical cores (12 logical cores with hyper-threading), and Intel UHD 630 GPU technology from Intel. While there are other CPUs in this family, the price difference is very small. The Intel UHD 630 provides a respectable entry level GPU that is supported by all major software makers. If your needs demand it, you can add a NIDIA GPU down the road. Due to PCI_e limitations of the Z370 chipset; if you plan on adding RAID-10 options, Thunderbolt, and a nVIDIA/AMD GPU then you should consider our DreamStation Extreme for Adobe CC. You can make your System RAM selections below. For the DreamStation Pro for Vegas Pro, we offer a 16GB, 32GB and a 64GB option. The new Z370 chipset brings support for 64GB of memory. This system uses a is basedÃƒâ€šÃ‚Â on a 'Dual channel' memory architecture optimized for use with the Z370 chipset and Core i7 8700K. In this section, you can make your keyboard and mouse choice. We include a wired Logitech keyboard and mouse from Logitech for FREE with every system. You can upgrade to wireless keyboards and mice buy making a selection below. The LogicKeyboard options give you your application shortcuts imprinted on the key caps. This is the easiest way to lean the shortcuts that will save you time when editing. This DreamStation now comes standard with a Solid State Drive (SSD) for a System drive or your 'C: drive'. The System Drive contains the Windows OS and your program files. Since your DreamStation is a multi-drive system, a smaller system drive is OK since you other drive volumes are used to store media assets and projects unlike a typical desktop computer with only one hard drive. The default system drive is a 250GB SSD drive. Other selections available include a 500GB, 1TB, or 2TB SSD system drive. The SSDs we offer for this system achieve nearly 600MBs read and write speeds. These speeds are about 4 times faster than a traditional 7200 RPM hard drive. The SSD System Drive speeds up all aspects of your system. For the ultimate performance, you can choose a m2. nVME Solid State drive. These SSD drives use a special slot on the motherboard and are smaller than a stick of RAM. These drives offer a direct PCI-e connection for speeds up to 2500MBs read and write! If your specific requirement calls for a traditional hard drive, we still offer that option as well however it is not recommended. The Render-Spare-Export-Drive is not required for your Vegas Pro System, but it's a good idea to have. Having a secondary SSD or hard drive in addition to your Media RAID can be important. This drive can be used as your EXPORT DRIVE for your exports to MPEG-2, Blu-ray, H.264/265, QuickTime, or anything you are exporting. Using a separate storage for exports will decrease your render times because the system will perform better reading from one drive and writing to another. In addition, it allows you to make backup copies of your important clips and projects. If you selected a 4TB Media RAID then a 4TB Storage drive makes sense. If you are a serious power user for Premiere Pro, After Effects, or Photoshop then you should consider adding an SSD drive for your Media cache, scratch disks, and After Effects cache. The SSD drive will considerably speed up those applications, when working with complex projects but you may need to pay more attention to the size of those files and periodically delete them or use the automatic settings found in CC 2017 to clear the cache files. 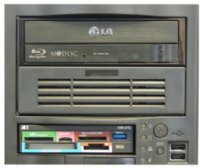 For this system, we include standard DVD Recorder that also burns CD's. Alternatively, you can choose a Blu-ray recorder that supports BD-RE at 16x, DVD's at 24X and CD's at 48XThe Blu-ray burner will handle both 25GB and 50GB disks. Cyberlink Power 2 go software (OEM version) is included with each drive. In this section, you can choose your option for the secondary full size bay. 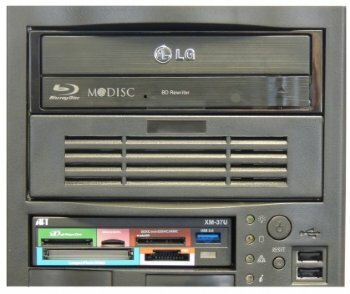 You can select a Blu-ray or DVD recorder with the same options as the primary optical drive or you can add a USB 3.0 (4) port hub for maximum flexibility on the front of the case. In this section you can pick your Display Adapter/GPU. This is the part of your system that connects your monitors and this component also plays a very important important role in your workstation for the recently released Vegas Pro 15. The Graphics/GPU is used to accelerate Vegas Pro for effects processing, real-time mixed format playback, encoding, etc. Vegas Pro uses the term 'render' a bit different that other software applications. 'Render' in Vegas Pro also refers to 'encoding' a project to a distribution format like MPEG-2 for a DVD, or H.264 for everything from youtube videos to broadcast codecs. The Intel 630UHD Graphics option as the default GPU choice and supports accelerated x.265 HEVC encoding within Vegas Pro and provides some render acceleration . The Intel 630UHD option is a great choice for projects that don't involve a lot of filters, multiple layers, or raw 4K video editing and encoding. There is always an option to add a Graphics/GPU card down the road with this base system or have it installed in advance. For enhanced performance with Vegas Pro you can now select a nVIDIA GPU card for this system boosts encoding and rendering. The nVIDIA GeForce GTX 1060 is the base card for a dedicated GPU. This card has 6GB of RAM, 1280 CUDA cores, and a memory bandwidth of 192GB/sec. Other options include the GTX 1070 and the GTX 1080ti which add additional processing power for effects. 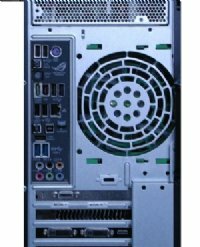 For this system, we also offer the nVIDIA Quadro P series card as a solution for customers who want compatibility with AVID Media Composer. The Quadro P series offer many benefits over a GeForce card. Due to the PCI-e limitations of this platform, if you are planning on adding 4K IO cards, etc, it makes sense to take a look at our Intel X299 based DreamStation Extreme for Vegas Pro 15. Please note that Vegas 13 or Vegas 14 do not benefit at all from acceleration. It was very buggy in version 13 and was removed in version 14. We highly recommend all users upgrade to Vegas Pro 15. In this section, you can choose your Internal Media RAID drive array. Please note that configurations that have 8 drives require the 8 bay case. The Media RAID (volume) is where you will store your video, audio, stills, and other media for online editing. Although the Media RAID shows up as one drive letter, it is actually made up of two or more spinning hard drives or Solid State Drives. We offer 2 types of RAID configurations. We use a multi drive RAID configuration for your media storage because one single hard drive is not fast enough to edit the formats used today in most cases. We useÃƒâ€š a proprietary 'caching' algorithm combined with our RAID configurations to enhance the multi stream performance. The end result is that you don't have to wait for your storage system to catch up to your creativity. In a RAID-0, we use 2 (or more) hard drives and combine them together so they appear as one drive letter (volume) in Windows. This is required for SD/HD/4K editing because a single hard drive is not fast enough. If you take the steps to make sure your important video and audio assets are backed up, then the standard (2) drive RAID-0 is adequate. Hard drives are mechanical, and they can fail. Our systems have numerous external ports for easy connection to USB 3.0, optional Thunderbolt drive arrays. There are many options to keep your media online and available. In a RAID-10, we essentially mirror a RAID-0. This is all done in the background with no intervention from you. The UPSIDE to this solution is fast speed with data redundancy. If a hard drive fails in the RAID, all of your projects and media are safe. With our RAID-10 configuration, if a drive goes down, the system continues to operate without a hiccup, and there is no need to rebuild a RAID-10 array to access your projects and media stored on it. Once you replace the failed drive, the array will be protected again. The DOWNSIDE to this solution is that it is more expensive, and doubles the number of hard drives required to implement it. Please contact us for higher end storage systems using SSD technology if your needs require it. Below is a chart that will give you idea of storage requirements for popular codecs and formats. CHOOSE YOUR ARRAY BELOW in the list. The RAID-10 solutions will protect your data. Magix Vegas Pro 15 is a brand new version that adds much needed improvements to the functionality finally ushering in a modern User Interface for 2017. Existing users will appreciate many of the new improvements, and new users will discover that Vegas Pro 15 is surprisingly easy to use and very powerful allowing editor's to do what they do best, which is create. nVIDIA GPU acceleration is back and with this new version now it actually makes a big difference in 'rendering/encoding speeds over previous versions. We offer all versions of Vegas Pro 15 and if you already own Vegas Pro 15 or a version going back 13, we'll install it for you. Vegas Edit includes the core Vegas Pro editing software. Vegas Pro adds DVD Architect for burning DVD's and Bluray dics, NewBlueFX Filters Ultimate as well as HitFilm Movie Essentials. The Vegas Pro Suite includes everything in Vegas Pro and adds Boris FX Sapphire and NewBlueFX Titler Pro 5 making for the ultimate production suite. In this section, you can choose an I/O device for your Vegas Pro workstation. We offer I/O hardware from Black Magic Design. These powerful cards and external boxes allow for real time 10 bit monitoring and capture capabilities. The Black Magic products offer impressive connectivity at a very affordable price. For an internal solution, the Black Magic Design Intensity Pro 4K is an internal card that offers HDMI HD/SD Capture, as well as SD analog capture from S-Video, Component, or Composite sources. You also get outputs of all of these connections allowing you to monitor your audio in video in full HD 1080p or UHD. The Black Magic Design Decklink Studio 4K offers an internal card with every connection a pros could ever use. You get HD/4K/UHD/SD SDI 3G, AES audio and multiple SD analog connections including 4 channels of audio. For an external solution we, we offer two choices. The first choice is the Black Magic Design UltraStudio 4K. This box is housed in a small 1U rack-mountable chassis and offers a wide variety of SDI and analog inputs/outputs. The Black Magic Design UltraStudio 4K requires the Thunderbolt card found the connectivity category further down the page. The next choice is the Black Magic Design UltraStudio 4K Extreme. This extremely versatile box is housed in a 4U rack-mountable chassis and offers the most connectivity of any product in it's class. Connection to your DreamStation is accomplished with Thunderbolt or the included PCI-e card. Keep in mind that all of our Graphics/GPU cards include the ability to have at least 3 monitors and most support 4 monitors. Vegas Pro allows you to use a computer monitor as a full screen preview display. The extra displays do take away from the GPU power available for effects processing making the BlackMagic hardware a worthwhile investment. Thunderbolt is required for the Black Magic Design UltraStudio 4K and recommended for the UltraStudio 4K Extreme. Click on the MORE DETAILS links to learn more about each model of the Black Magic hardware. We now exclusively use Windows 10 Pro 64 bit for all of our video editing systems. Windows 10 Pro has proven to be very stable and much faster than Windows 7 since it's release in 2015. All of the major software makers now support Windows 10 including Adobe CC 2015-2017, AVID Media Composer 8.3 and higher, Grass Valley EDIUS, Magix Vegas Pro, Davinci Resolve, and all current plug in makers. As part of your install, we turn off the annoying parts of Windows 10. You won't get suggestions for the latest games and feature updates are deferred and won't install automatically. Windows 10 Pro is required for this system because the new Intel 8th Coffee Lake processors used in this workstation are not supported by Windows 7. The standard configuration comes with (2) wired GigabitLAN ports. Select a wireless option if you would likeÃƒÆ’Ã†â€™ÃƒÂ¢Ã¢â€šÂ¬Ã…Â¡ÃƒÆ’Ã¢â‚¬Å¡Ãƒâ€šÃ‚Â Wi-Fi with the standard configuration. Select the 1394 FireWire port for DV/HDV capture if need a 1394a FireWire port on your system. Select the Thunderbolt add in card to add (1) Thunderbolt V2 ports for use with Thunderbolt devices. Please note that the Black Magic Ultra Studio 4K requires a Thunderbolt card. This workstation supports the new RealTek S1220A audio solution. This powerful integrated solution features an unprecedented 120dB signal-to-noise ratio (SNR) for stereo line-out and a 113dB SNR for the line-in, providing pristine audio quality never before available in an integrated solution. The days of pops and hisses with onboard audio are long gone. We have many other options available for external audio solutions for our customers who are more focused on audio production. Please contact us at 1-822-203-0871 x202 for more information. In this section, you can choose your speaker configuration. The standard speaker set is the Creative Inspire T10. You can also choose one of the M-Audio AV series of speakers. These ZERO reference speakers allow you to monitor your productions as your customers will hear it. For interface and preview display monitors, we are pleased to offerÃ‚Â Samsung and LG monitors. Besides amazing accurate color quality and accuracy, each Samsung monitor we offer comes standard with TILT, PIVOT, and HEIGHT adjustments. The Samsung 32" monitor is a great choice with a lot of screen real estate. This Samsung monitor offers amazing 30 bit color (over a billion), and 30 BIT resolutions up to 2560 X 1600. 4K or UHD monitors are starting to become widely available. However, most of the models priced at less than $600 have very poor refresh rates making them unsuitable for video editing. You may choose a 4K monitor for use as an interface display (or two), or use it as a preview display. After looking at the modelsÃ‚Â available, weÃ‚Â believeÃ‚Â the LG model we offer gives you the best color (nearly 100% Adobe sRGB) and atÃ‚Â 4096 x 2160 (17:9). This monitor Ã‚Â operates at the exact resolution of Digital Cinema 4K and support for 30bit color for over 1 billion colors. Power Protection is very important to keep your system and your video clips and other media healthy.Ã¢â‚¬Å¡Your most basic protection is the surge protector that we offer. If you live in an area where your power frequently goes out the 'UPS' is a must haveÃ¢â‚¬Å¡accessory. We offer a couple of UPS (Uninterruptible Power Supply) units with the specs needed to keep you system safe in the event of a power outage. The UPS also helps to smooth out your incoming power making your system more stable. Our UPS solutions will safely shut down your DreamStation gracefully in the event of a power failure even if you are not at home (USB Connection to UPS required). The system will enter into a hibernate mode and power off after the current state is saved. When you restart, you can make sure you saved any changes and then reboot the system. The UPS options we offer have wattage ratings for the case you have chosen. Choose the 900W for the smaller case, and the 1320W for the larger case. You will be able to connect monitors (LED/LCD) to the UPS since there is enough head room. The UPS must have a minimum AVR rating of 1500VA/900W or damage to the system may occur. Let us know the model number and we can tell you if it is suitable for your system. We have a long history of providing exceptional support to all of our customers. 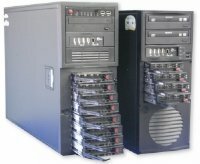 When you buy a system from videohardware.com, we support both the hardware and the software so you aren't forced to look around for answers to issues that may arise. We offer LIFETIME SUPPORT for all of our workstations. We will answer your questions long after the warranty has expired. If you are having any type of issue, we are in a unique position to understand whether your issue is software or hardware and quickly resolve it because we use and understand the software as well as the hardware. Our DreamCare Standard Warranty and Support plan covers you for 2 years. Select our Premium plan to extend the support and hardware warranty tor three years with extended support hours. You can also get details by click on the MORE DETAILS button.